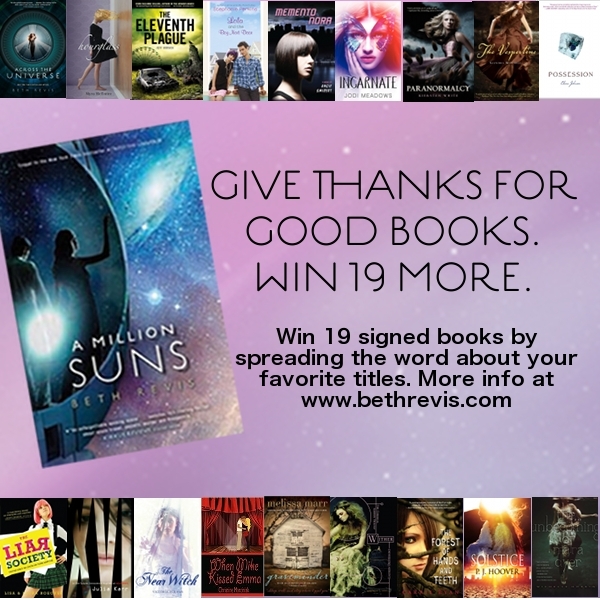 Beth Revis, author of the incredible 2011 debut Across the Universe (<--- click the link to read my review) is having an epic giveaway. 19 books, a boatload of swag, one winner. All you have to do is write a post about the book you're most thankful for. The book(s) I'm most thankful for are Harry Potter by JK Rowling. If you're a regular on my blog, you'll know that I'm a Harry Potter fanatic. I swear 99% of my Follow Me Friday posts include HP in some way. And there's a reason (or 20) for that. Harry Potter was my reintroduction to YA. 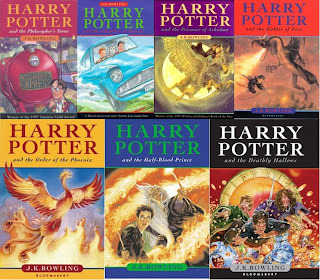 I had pretty much stopped reading young adult novels because I thought I was 'too old', but I made an exception for Harry Potter, and they became instant favorites. So, really, they're the books that started my love affair with YA - for that alone, I'm extremely grateful. I love Harry, Ron, and Hermione. I got to watch them grow up, and I've known them so long, I feel like they're real people. They're such fantastically-written, believable, relateable, likable characters. They pop off the pages and grab your heart and never let go. All the secondary characters are incredible, too, and I got attached to them very easily (which made it that much harder when Rowling decided to kill some of them off...I cried through at least half of Harry Potter and the Deathly Hallows, and during the last movie...well, I hadn't cried that hard in ages). The books themselves...my god. Just amazing. I've never been able to completely immerse myself into a world the way I have with Hogwarts. It's so real. JK Rowling has such an easy writing style, but there's something about it that is so beautiful and magical it draws you in and you feel like you're really there - on the train, or in the Great Hall, or in Snape's classroom, or strolling through the streets of Hogsmeade and Diagon Alley. Then there's the lessons in Harry Potter - lessons about love, friendship, loyalty, good versus evil, persevering, and so many other things. How many people are lucky enough to have friends like Harry, Ron, and Hermione, who would do anything for you and be there for you no matter what? How many of us have had to overcome seemingly impossible obstacles? I would think that no matter what a person's life is like, there's at least one situation in Harry Potter that people can relate to. Another reason I'm grateful for Harry Potter - it's one more thing that has brought my mum and me closer together. We're best friends as it is, but she's one of my only friends who has read the series, and therefore gets my HP references (and obsession). I was also beyond thrilled when my nephew Noah showed an interest in the movies a few years ago. I didn't think he'd like them, but one night he was sleeping over and asked to watch one, and he watched the entire thing straight through. I couldn't believe it! Since then, it's been a common bond for us and has brought us closer together, too. We even went to the Harry Potter Exhibition last summer, which was pretty much the coolest thing ever. I can't wait until he shows interest in reading the books. The world wouldn't be the same without Harry Potter, in my opinion. I know my world wouldn't be, anyway. I've heard so many people say that Harry Potter got them into reading. I've also heard people say they want to be writers because of JK Rowling. To me, that's an incredible thing.